We have to agree with the readers on this one. 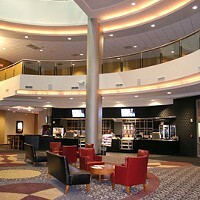 With a courteous and competent staff on hand to assist customers and a veteran projectionist making sure that the films run smoothly and on time, this midsized moviehouse is large enough to play all the hit titles yet small enough to offer that personal touch missing from its larger counterparts. Runner-up is last years winner, Ballantyne Village Theatre. 6911 Phillips Place Court. 704-556-0896.